While I have been home visiting, my grandma sold her house in order to downsize. Downsizing meant going through all of her stuff and getting rid of lots and lots of things. It was such a bummer seeing everything go. Before I moved out east, I lived next door to her. 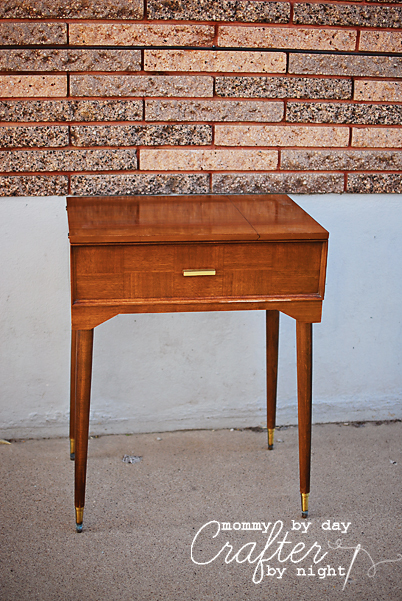 If I had still lived there, I would have been able to inherit a lot more vintage goodness... but I am totally happy with the one vintage treasure I get to keep for myself. A table... BUT- not just any table. Open it up and you will find my vintage treasure. Are any of you swooning yet?? I could not believe that I had no idea this beauty even existed! 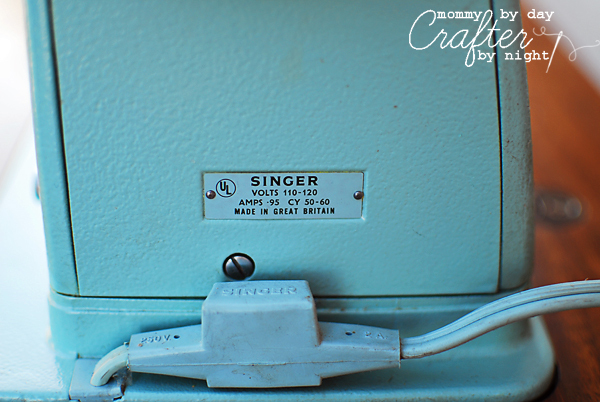 This vintage Singer sewing machine used to be my great grandma's machine. When my dad was cleaning out my grandma's basement he found this. 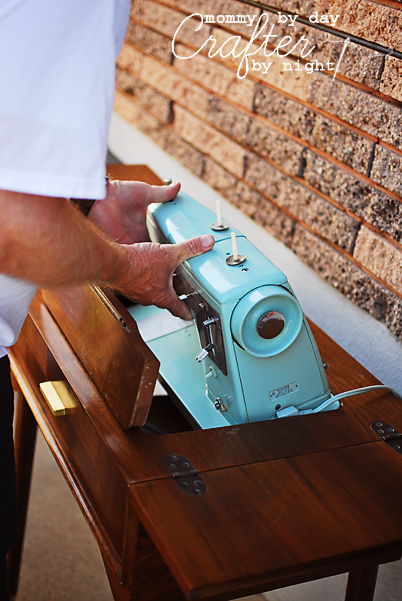 He asked if I would be interested in an old sewing machine and of course I said yes (before I had even seen it). 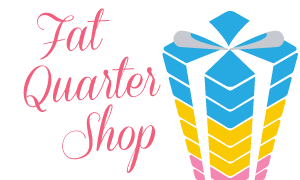 When I walked in and saw that it just happened to be my favorite color, robin egg blue, I definitely had a swooning moment. From the little research I have done on it, I think it is from the early 1960's. It probably wouldn't be worth a ton if I were to sell it. But are you kidding me- who in the heck would want to sell this thing!?! It definitely has some signs of heavy use and is not currently working. I never got to meet my great-grandma because she passed away when my mom was young, but from all of the wonderful stories I have heard about her, I can totally picture her sewing up a storm with this beauty. This table keeps everything stored right inside. Even the pedal (and 50 years worth of dust) fits in there. Oooooo! Awesome! I have a pile of buttons from my Grandma's sewing drawer, but that's it. 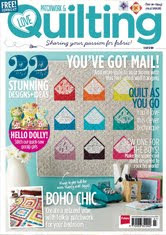 No robin's egg blue sewing machines. Hope you find a way to be reunited with all your goodies soon! Yup....there's a lot of swooning going on down here in TX!! This is fabulous!! I love the color! Congratulations on your new baby. Vintage machines are awesome. I myself have three of them. Oh and the vintage fabric. You have to share some pics when you get them out. That's something to swoon over. 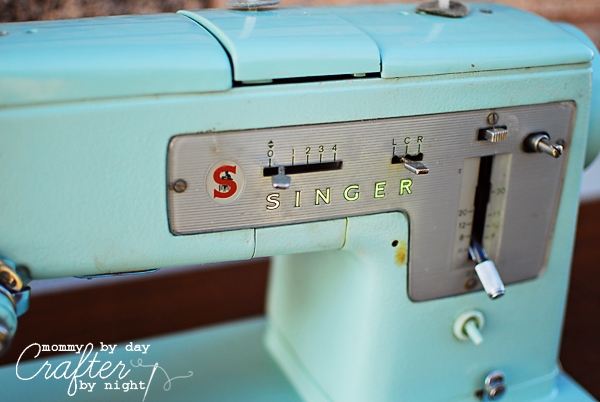 I was fortunate enough to inherite a Singer featherweight from my mother-in-law. It came in a cute black carry case and all. It works like a charm, I use it a lot. Also found some vintage fabric, ric rack and notions. Just beautiful! Lucky, lucky you! 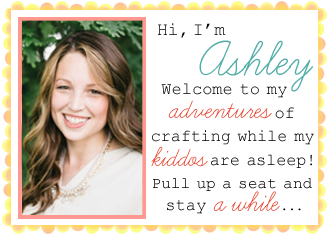 Oh Ash! It's gorgeous! Honestly, wouldn't you paint it that amazing blue if you wasn't already? How perfect! It's charming. What a treasure for sure. I would have to say my Grandma's pots she gave me. They cook better than anything ever. I love them and I can't help but think of her when I use them. I wish I had been into sewing when my mom got rid of hers. It was pretty close to the same as yours. I'm really kicking myself now. I really love the blue color of yours. I LOVE vintage machines! If you can get it serviced and working, I personally think they sew so much better than modern machines, due to no plastic parts. Congrats on your beauty; hope you can get her home soon. Ohh I love the color! I have an old singer machine that was my great grandma's. It doesn't have a petal... you acutally have to use your foot to get it going (not even sure what those are called) hah! My mom had it fixed up a few years ago and tried to get rid of it! Umm.. NO! So now it's sitting in my garage until I find a place for it! I love vintage fabric! Have any plans for it yet? 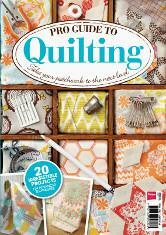 I guess every sewist/crafter would love to own something sewing-related vintages. it looks very well maintained.... nice!! 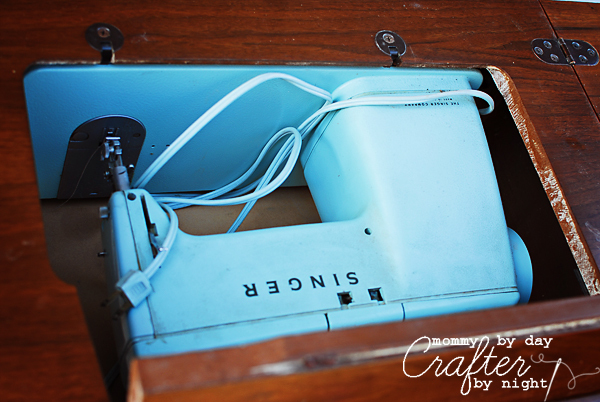 that table was gorgeous on it's own...but then that blue sewing machine? SWOON! Love that color! 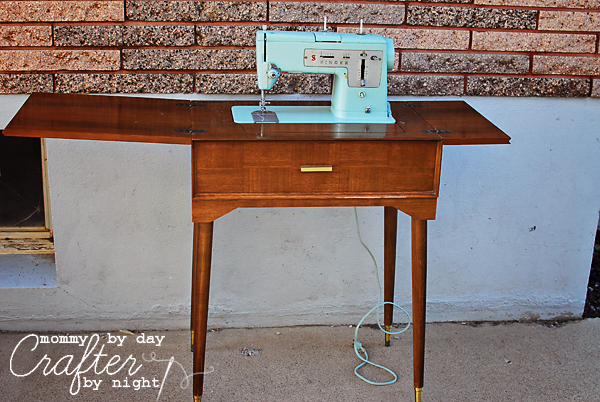 Several years ago I inherited a similar sewing machine and table from my grandmother. I also did not want to part with it once it became "mine" so my dad helped me crate it and we shipped it "air freight" on my flight. It cost us more to ship it than the price of my own ticket, but worth every penny to me. Wow- that's awesome! I especially love things like this that have a special meaning behind them for their owner- so special! I love the color of your beautiful find! My Abuela gave me her sewing machine and cabinet and I made quilts and dresses for my daughters. I have since moved up to fancy dancy computerized sewing machines, but would not get rid of her old machine for anything. 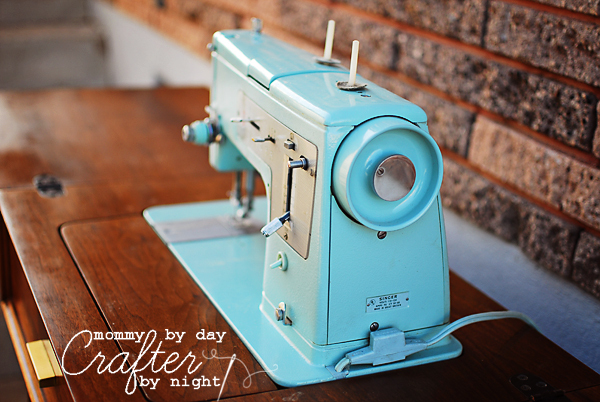 Now that you've reminded me, I think I will set up the old girl and sew something on it for old times sake! It is a great machine! you can take it home with you. Just un-attach it from the cabinet, it is easy it is only 2 screws. You don't need the cabinet to use it but if you really want a cabinet check on Craigslist or make a request and you will receive offers.. the cabinet should not be more than 30 bucks if you try to ship the whole thing is is probably going to cost $100 if not more and the risk of damaging the machine is very high. You can't go wrong with that Singer... you will find spare parts pretty easy online but it might only need a good cleaning and oiling and you should be ready to go! congratulations on your new baby! I had to check out this link on your Kojo post. I am so jealous! And the fact it was your grans makes it extra special too! 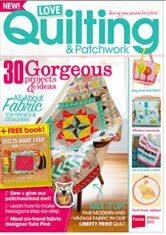 I learned to sew on one of those machines and made my first 3 or 4 quilts on it. It was my Mom's. I've been looking for one for a while locally for sale. What a great machine and the cabinet is gorgeous! 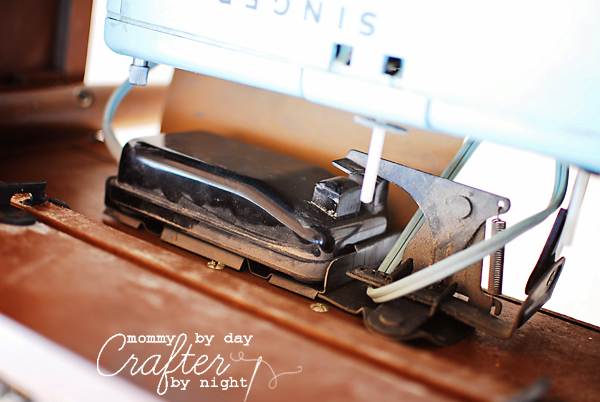 I have the exact same sewing machine which my parents purchased for me when I started the eighth grade. The year before I had taken Home Economics and fell in love with sewing. At that time, I had a Singer children's sewing machine that I used for making doll clothes while I was in elementary school. A few years ago I had the machine cleaned and oiled, and it is still in perfect condition. 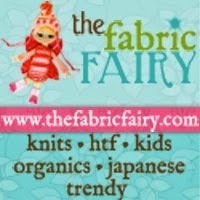 My daughter, who does not appreciate the joys of sewing, asked if she could have it to do clothing repairs when needed. 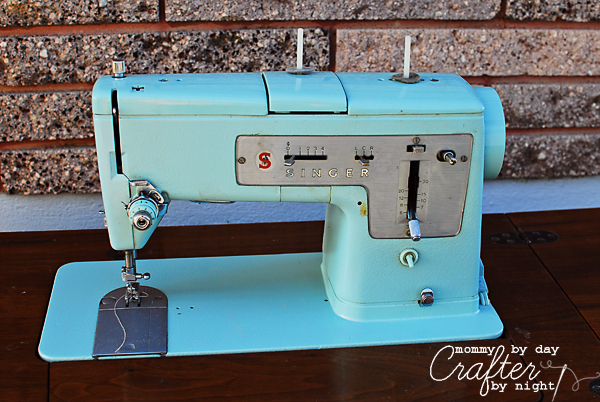 It was my first real sewing machine! THIS! 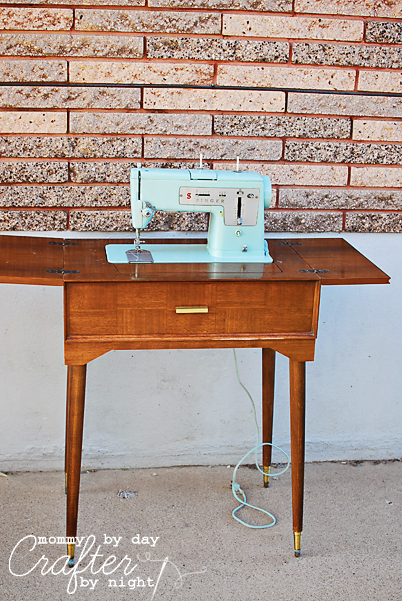 This was also my grandma's old table sewing machine she used to make us clothes and dolls and everything in between, but hers was pink. Is there a model number anywhere on it besides the made in label? I've been trying to fine one without much success, most I see are blue like yours, which is gorgeous! But I'd love a pink one for nostalgic reasons.